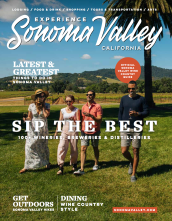 Recognized as one of California’s top culinary destinations, it’s not just the wine lists that wow at Sonoma’s most memorable dining establishments. From prestigious pairings to sophisticated farm-to-table fare to award-winning local produce, here are 10 epicurean experiences that foodies won’t want to miss. Founded by award-winning wine producer, Lloyd Davis, Corner 103 offers relaxed, high-quality Sonoma County wine tastings - expertly paired with small bites - for a maximum of 10 guests at a time. For an intimate four or six-course food and wine pairing, with limited production artisan bottles and a Japanese-inspired menu prepared by Chef Yoshiharu Sogi, Zina Lounge is a memorable meal out. Taste award-winning Pinot Noir and Chardonnay at the informal WALT Wines, just off Sonoma Plaza. Savor prestigious varietals in unhurried tastings, and while away the whole afternoon happily here. A stunning Mission-style dining room surrounded by mountains sets the scene for a food and wine pairing to remember at St. Francis Winery . An award-winning combo of fine-dining and artisan varietals. Known for sophisticated food without the fuss, the tasty farm-to-table Californian fare and thoughtful wine list at vibrant downtown eatery, Cafe La Haye, make advance reservations well worth it. Enjoy a dinner party with a difference at Ramekins, where you’ll use ingredients straight from its 5th Street Farm to cook a Californian-inspired meal together in its Spanish-style courtyard. From cheesemaking classes to award-winning cheese and wine pairings to artisanal picnic supplies, Epicurean Connection, is a must-visit for foodies. Family-run Figone’s, handily located on the picturesque Sonoma Square, is a small specialty Olive Oil and Balsamic producer. Free tastings of its premium oils is a must while exploring downtown. One of the top 100 restaurants in the world, dining at the AAA Four Diamond Award and Michelin star designated Sante is worth the trip to Sonoma alone. Food is elegant yet simple Wine Country fare. Mayo’s seven-course pairing menu promises to be a tasting like no other. Featuring reserve label wines and handcrafted bites, it’s served alongside wine-inspired art, music, and hillside views.